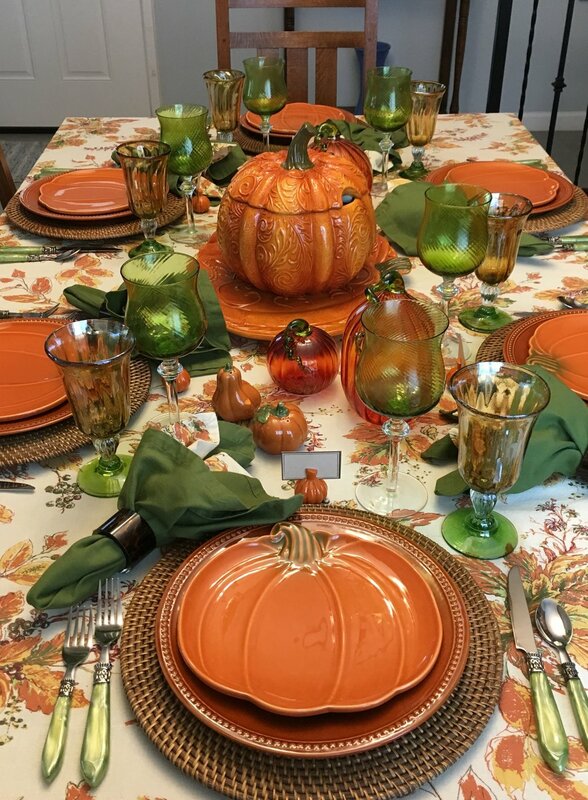 So it’s time for a fall table setting. I have been pondering this one for a while and finally pulled it together so we can enjoy it for a bit before the Halloween one. The tablecloth and print napkins are April Cornell from HomeGoods. I really love that leaf design. The green napkins are from Pier1 I think. I often buy napkins there on sale. The pumpkin plate is from Sur la Table this year. 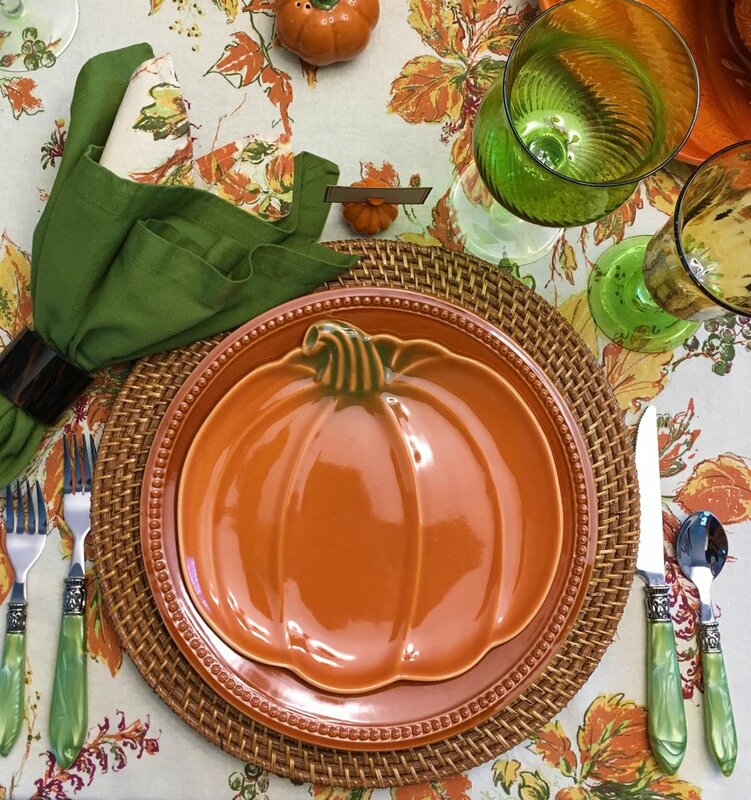 I have been looking for a good pumpkin plate for some time and it is the perfect color. The dinner plate came from Pier1. It was part of their Spice Route Collection, color pumpkin, but looks like they are sold out of that color. Not sure where I got the wicker charger but if you google it several places have similar ones. The Madeline green flatware is available at World Market. I use this flatware often in the fall months. The Tortoise shell napkin rings came from HomeGoods. The pumpkin place card holders came from Crate and Barrel. I bought the salt and pepper shakers on ebay. 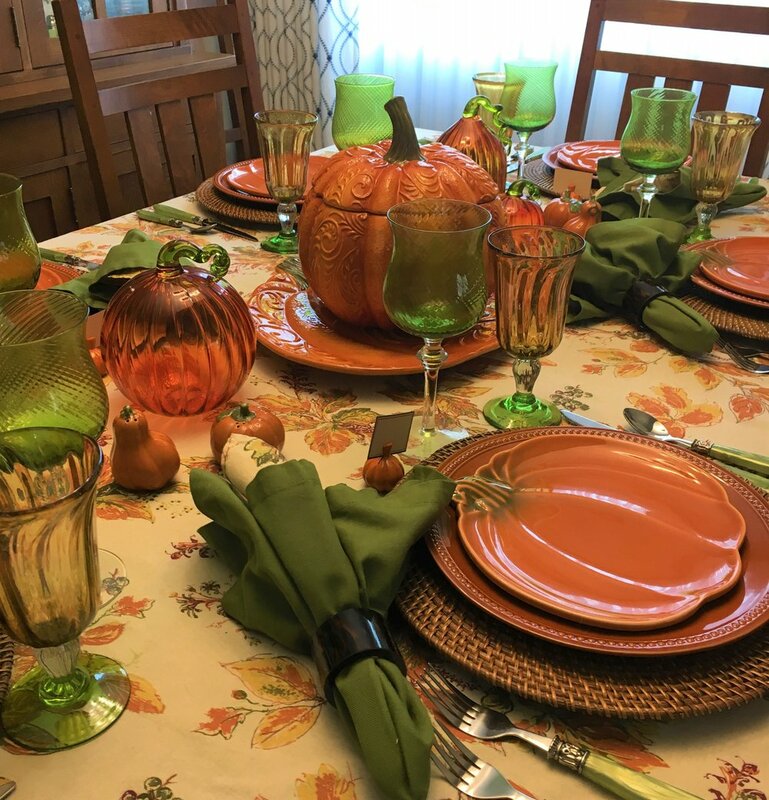 The centerpiece pumpkin tureen and platter came from Pier1 a few years ago and I have individual pumpkin soup bowls that match, I really love the swirly pattern. We bought the glass pumpkins on a long weekend up the coast a few years ago. The green goblets came from Pier1, I use them often in table settings. The amber and green goblets are from Mexico, I bought them online but can’t remember where. I think the tablecloth really pulls it all together!